There are now plenty of Espressif ESP8266 boards or module to play with, but most of them require some cables or wires, at least for power. WiThumb does not need any of that as it’s designed to be plugged into any USB ports, and includes a 6-axis motion sensor, and a temperature sensor. 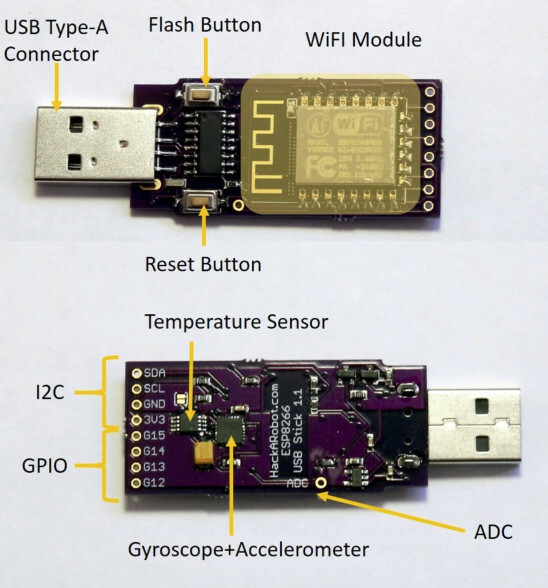 The USB stick can be programmed like most ESP8266 board, i.e. via USB using the Arduino IDE. 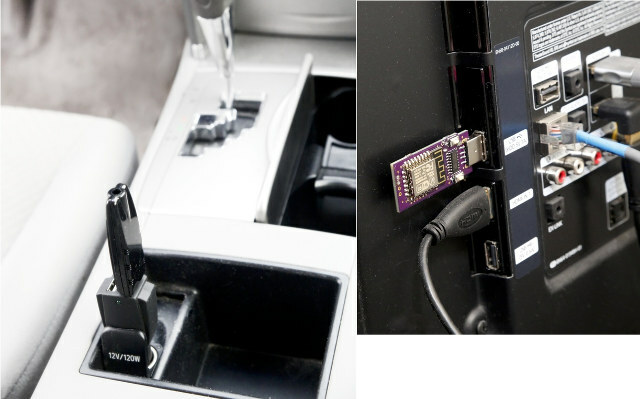 In case you wonder what kind of application it could be useful for, the developer has come up with a few ideas including an Internet connected thermometer, an IMU (Inertial measurement unit) for drones and robots, home/office security (using motion sensors), IoT gateway,WiFi sniffer,Monitor or TV usage logging, driving habits logger (with accelerometer), and many others with you augment the USB stick capabilities through I2C, GPIO or ADC. As many other projects, WiThumb has gone to Kickstarter to get funds for mass production, and has almost reached its lowly $2,000 funding target. A $19 pledge should get you WiThumb, but you may want to add $3 more to get the plastic case too, and there are rewards with multiple WiThumb. Shipping adds $4 to the US, and $10 to the rest of the world for one unit, and only a little more if you purchase several units. Delivery is scheduled for November 2016, except the “developer’s deal” reward (September 2016). You may also want to checkout hackarobot.com for info about previous projects by the developer, and access to support forums. Needs a battery charger ic and connector like wio link. Monting temperature sensor right on the back of ESP module is a terrible idea. This will end up showing anywhere between real temperature and real +5 degrees C, depending on whether ESP was in deep sleep recently and how much. I agree, with shipping cost at $4 we could get 2 of ESP-12F! True. At least there is no copper layer under it. Could be worse. Luckily esp8266 is very forgiving of RF matching. What a terrible design! And very costy board. I wouldn’t pay even $5 on this thing. is it some kind of convention to put gpio pins on the far border ? That antenna right in the middle next to the ch340(?) is kind of a bold design choice. I don’t know much about RF interferences but i do know that slow TTL signals will really don’t care at all being blasted by wifi. Anyways wifi pcb antenna and tiny designs will always produce weird/scary layouts, you just have to extensively test them and live with their limitations. And i agree the price is steep, i’m getting bored seeing all those DIY projects hitting crowdfunding to produce a batch of boards. You can get 10 pieces pro quality pcb for 10-15$, do your thing, make it open hardware and put it on a blog !